Samsung 850 Pro MZ-7KE128 128GB Expert Reviews - Read Reviews and Buy Smarter Online. Verdict: If you have a SATA-based PC and want to fit it with the best storage, take a close look at the Samsung 850 PRO. Samsung 850 PRO 1 TB review. Samsung 850 PRO 1 TB benchmarks. Verdict: The Samsung 850 PRO arrived just too late for last year's round-up of the best SSDs, but even a year down the line it still has little serious competition in the stakes for the world's best SATA SSD. Verdict: Samsung has built a good reputation for fast and high-quality SSDs. It introduced the 470 to desktops four years ago, and its SSDs were in high-end laptops before that. The company also distinguished itself by designing its own controller chips and manufacturing its own NAND flash memory. Verdict: October 20, 2014 by Lawrence Lee Product Crucial MX100 512GB 2.5 inch SSD Samsung 850 Pro 256GB 2.5 inch SSD Manufacturer Crucial Technology Samsung Street Price US$210 US$190 Crucial and Samsung are two of the biggest names in solid-state drives. Verdict: I wasn't kidding earlier. Samsung has so much confidence in the increased endurance of their V-NAND that they've upped the warranty to 10-years, rated at 40GB of writes per day, which equates to 150TB of total writes. Verdict: We didn't spend a lot of time talking about the 3D V-NAND in this article or RAPID Mode. We just published a very detailed V-NAND whitepaper and RAPID Mode was discussed in detail in our initial reviews . The 850 Pro is a complicated product made easy by its performance. Verdict: We've seen many solid state drives over the past few years, some memorable and some forgettable. But it's rather rare to see new technologies emerge that push the boundaries of performance, features, and even pricing. Verdict: The Samsung 850 Pro is the first Samsung SSD to use a new type of NAND flash: 3D V-NAND. Although it's a very complicated technology, 3D V-NAND is potentially very important for the future of SSDs. Verdict: Last year, Samsung were the first manufacturer to mass produce 24 layer V-NAND for use in enterprise solutions. Never wanting to rest on their laurels, Samsung have today unleashed an enhanced 32 layer 3D V-NAND equipped drive for the enthusiast market. Samsung 850 Pro 256GB/512GB/1TB review: back at the top! 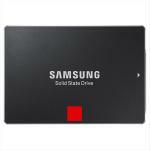 Verdict: Samsung recently introduced their 850 Pro SSDs, which are the first consumer-oriented SSDs based on 3D V-NAND. Do they allow Samsung to reclaim the performance crown? Verdict: It would be fair to say that the Samsung 840 Pro was one of the best SSDs we have tested. It offered class leading performance, good build quality, a decent software suite and a good warranty. Verdict: The 850 Pro is Samsung's new flagship consumer SSD, and the follow-up to the wildly popular 840 Pro, which was one of the best performing SSDs money could buy when it launched in September 2012. We're reviewing the 512GB model here which is priced at ￡232 (US$399, around AUD$420). Verdict: Samsung does not cease to amaze me with their SSDs as the 850 Pro just kills it in every aspect. The performance is there. The endurance is the best of the class. Heck, even Samsung's feature and software suites beat the competition by a mile. Verdict: Before we weigh in with our final verdict, we'll bust out a few of our famous value scatter plots. The best solutions will gravitate toward the upper left corner of the plot, which signifies high performance and low prices. Verdict: The Samsung SSD 850 PRO gives enthusiasts about everything they could want in a single SATA SSD. Like drives before it, Samsung has infused the SSD 850 PRO with new technology to make it a class leader in terms of performance, endurance and warranty. Verdict: Ever since our first discovery of the 470 Series SATA 2 SSD way back in 2010, Samsung has been unstoppable, carving out a new standard with every SSD release. The release of the 850 Pro SSD with 3D V-NAND is a perfect example of just that. Verdict: Today Samsung is unveiling their latest SSD and successor to the mighty 840 Pro. Named the 850 Pro it is not only faster than the 840 Pro and possibly the fastest SATA SSD money can buy, but more importantly it is also one of the most reliable thanks to its use of V-NAND flash memory. Verdict: In the past few weeks, we've seen a steady stream of new solid state drive releases, from the likes of Plextor, Crucial, and SanDisk. Our review of the Plextor M6M mSATA drive can be found here , and we covered Crucial's MX100 series here . Verdict: Time will tell, however from past purchases the Samsung's have proven very reliable. This drive comes with system copy software as well as health analysis software. Verdict: Solid reliable SSD drive. I use it to replace an older and smaller, 500GB, Crucial M500 SSD drive. This 850 Pro drive is much faster to boot and run programs. Verdict: So far so good with my scheme for updating a very indifferent and slow laptop. 2 mins to install, just goes exactly where your HD went, in my case attaches to small caddy using same screws that HD used. Verdict: Replacing a hard drive, use an SSD. Increases your system performance by at least 3 times. The PRO model has a 10 year warranty, nothing else like that. If they are offering that type of warranty, you know they used the good stuff to build it. Although I hate Samsung, this is about the best SSD available on the market today. Verdict: This is about the highest rated SSD on the market. Unfortunately, I don't like buying Samsung products, and my family has had very bad luck with Samsung appliances. We won't EVER buy another Samsung washer, dryer, refrigerator, etc. However, Samsung is a leader in SSD research and development. Verdict: Installed it in a mid-2012 MBP unibody A1278 with macOS sierra update, 16GB RAM, after the factory HDD crashed. Reinstalled Yosemite on the SSD. EtreCheck went from "very poor" to "excellent". MBP boots up very fast. Verdict: If one cannot afford nor wants to play in the new & growing world of NVMe SSD's, this is top of the line. Only one or two other brands offers a 10 year warranty on the same drive, or 150 TBW written. Verdict: Installed this in a new Intel i7 NUC, which only accepts M.2 SSD's. Installed flawlessly, and works perfectly in this unit. Verdict: Easy to install, and the results are immediate. My laptop is lightning fast now, and the only downside is that I can't go to the restroom on loading times anymore. Definitely a must-buy! Verdict: Coming from the old hard disk, I'm very impressed with the performance of this Samsung 850 Pro SSD. If there is no Windows update, I think my computer is shutting down in 3 seconds. I replaced my WD Black Edition with this SSD and very impressed with the performance. Absolutely recommended. Verdict: I bought this SSD for both its quality and storage size. Went in without a hitch and the Samsung software easily copied my two 400GB RAID 0 drives to it flawlessly. Three partitions were copied. Not one hitch. If you want more speed, buy several smaller size 850 EVO Pros and RAID 0 them. Verdict: Bought this to refresh my ageing MacBook pro 2011. Decided to reinstall OS from scratch. Plopped it in. Now it is running like new with loads more headroom. No need to go out and buy a new, and expensive, MacBook replacement - hence this drive was a really bargain. Verdict: Degrading performance had me take the step to upgrade the hard drive. Glad I did, faster loading, quicker responses have enabled me to do more work in less time. Verdict: Makes any PC come to life and boot up 'instantly'. This is very suitable for top range i7 Laptops (or PCs) and works well with fast Vengeange DDR ram. Like turning your PC into a top end Mac Book Pro. Result is top score on Windows performance ranking. Cons: Stops responding every once in a while requiring a reboot Very bad firmware support search samsung 850 pro firmware if you want to see for yourself.. Verdict: When it works it's good. Next time a different brand. Verdict: Got two of these a few weeks ago. I have raided them together on my iMac 27" in a thunderbolt enclosure. (StarTech.com S252SMTB3 - Thunderbolt Hard Drive Enclosure with Thunderbolt Cable). I get read speeds over 880mb/s and write speeds averaging around the 850mb/s mark. Amazing drives. Verdict: Samsung's new 850 Pro line of SSDs are easily the fastest on the market at the time of publishing. They offer all the newest features in one single package. Samsung's 3D V-NANA, RAPID Mode, and the huge 150TBW make this drive stand out from the crown.